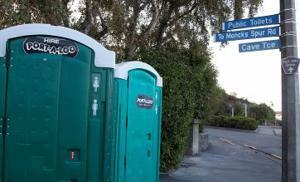 It's been a comparatively eventful week in the world of portable toilets. Here are the three biggest port-o-john news stories that emerged from across the the U.S.
A trio of presumptive master criminals - a 36-year-old, and two brothers of the ages of 21 and 19 - have been arrested in Chenango County, Connecticut on third-degree grand larceny charges for the theft of four portable toilets. According to ABC affiliate News Channel 9, the stolen commodes are worth $3,000 total. The news source does not mention if the alleged criminals planned to sell the toilets, or who would want to buy them. Meanwhile, on the other side of the U.S., city officials in Spokane, Wash., have installed three Honey Bucket portable toilets in their downtown area. Members of the city's homeless population will have a private place to relieve themselves. According to the TV station KREM, this was done following complaints from nearby businesses that homeless people were "going" on buildings, or basically wherever they felt like nearby 4th Avenue, under the I-90 highway. Homeless people who spoke to the news source said they plan to make use of the new toilets, but question whether or not three toilets are enough to cover the needs of every nearby homeless person. In the event of a weather disaster that would force students to remain inside their classrooms for extended periods of time, emergency toilets have been implemented in the Pasco County school district in Florida. The Tampa Bay Times describes these as white plastic buckets with seats, although they come equipped with toilet paper, hand wipes, bag and latex gloves, so at least users will be able to clean up afterwards. Nearly 2,250 have been distributed throughout the district, with another 552 waiting in a warehouse to be doled out. Some students who spoke to the news source said they thought these toilets might be a practical idea. Others were too grossed out to consider the possibility of relieving themselves in the presence of their classmates. "It's a terrible idea," 14-year-old Justin Anahory told the news source. "No, I'm not going to use it." "Never. Unh-uh. I would just hold it" said Sydney Steele.